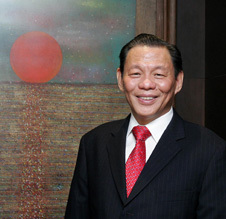 Sukanto Tanoto is the Founder and Chairman of RGE, a global resource-based group of companies with corporate offices in Singapore, Hong Kong, Jakarta, Beijing and Nanjing. He started his first business in 1967 as a supplier of spare parts and construction contractor to the oil industry. An entrepreneur and visionary, Sukanto founded RGE as a plywood business in 1973. Today, RGE is a global group with assets exceeding US$$18 billion, a workforce of 60,000 people and manufacturing operations in China, Indonesia and Brazil and sales offices worldwide. The business encompasses five key operational areas: pulp and paper (APRIL – Asia Pacific Resources International Holding Ltd and Asia Symbol), palm oil (Asian Agri and Apical), specialty cellulose (Bracell), viscose fibre (Sateri), and energy (Pacific Oil & Gas). Mr. Tanoto strongly believes that a company can only be successful if it is a responsible corporate citizen. Guided by his principle that all business should be conducted in a manner that is good for the people, good for the country, good for the climate, good for the customer and good for the company, Mr. Tanoto ensures that each of his businesses undertakes responsible environmental and social stewardship by embracing and integrating the concept of corporate social responsibility (CSR) into its business. CSR programs include integrated farming training schemes which have changed thousands of subsistence villagers into self-sufficient and sustainable farmers. Other community development activities include small and medium enterprise programs to help establish businesses, vocational training, community fiber farms and social infrastructure support. In 1981, he and his family formed the Tanoto Foundation to help reduce poverty and advance human achievement. Working in the areas of education, health care and disaster relief, the Foundation provides scholarships to students, honorariums to teachers, builds schools, distributes equipment and books. It also provides health care in remote areas and rapid-response assistance in earthquakes and other natural calamities. Mr. Tanoto is a member of the INSEAD International Council, the Wharton Board of Overseers, the Wharton Executive Board for Asia, and various other educational, community and industry bodies. He is a recipient of the Wharton School Dean’s Medal Award, which recognizes individuals for their contributions to the enlargement of the global economy and to the improvement of lives worldwide. Past recipients of the award include Chiefs of State, Nobel Prize winners, and Chairmen and CEOs of companies. In June 2017, RGE Founder and Chairman Sukanto Tanoto gave an interview to CNBC's Lasting Legacy programme chronicling RGE's 50-year journey and how, aided by his family and an experienced team of professionals, they are collectively building a legacy to last. Read the CNBC article and watch the programme here.